Stuck for what to buy your favorite wine geek this Christmas? I'm here to help. Any wine lover I know would be thrilled to find one of the following under the tree. Most wine aficionados I know like to save the empty bottles of their most precious wines and display them. A particularly chic and eye-catching method of doing so is with a High Heel Wine Holder & Stopper ($19.99 at Home Goods). Mine is festooned with sparkles and is especially fetching. Or, I suppose, you could just use an actual dance slipper if your foot is wide enough. Wine lovers can never have too many corkscrews lying about. One of my favorites is the iconic, award-winning Original Rabbit Corkscrew ($50), which pulls a cork in three seconds flat and then automatically releases it. There's a built-in foil cutter, which means you don't have to fiddle around with that dull little knife that comes with most corkscrews. For more traditional wine drinkers, I can guarantee they would love a classic French corkscrew made by the five-century-old Chateau Laguiole. Laguiole makes a variety of corkscrews—mine happens to be made of gorgeous cherry wood and high-carbon stainless steel—that sell for around $100, including a leather carrying case. There are a lot of knock-offs out there; don't be fooled. Champagne glasses have come a long way. In the old days, bubbly was usually served in clunky, shallow, short-stem coupes. However, those coupes allowed a lot of air into the glass and a lot of bubbles to escape. Plus, they're difficult to drink out of without spilling valuable Champagne down the front of your tux or gown. Then, along came Champagne flutes. These are tall, narrow glasses that serve to keep air out of the Champagne and to keep the bubbles in. That's an improvement. Yet most wine benefits from some aeration. So on to Plan C: Designed and produced by the premium wine glass manufacturer, Riedel, the Riedel Veritas Champagne Wine Glass (2/$69) is a hybrid wine glass and Champagne flute, made specifically for sparkling wine. I've tried virtually every Champagne glass on the market and I have to admit: The Riedel Veritas Champagne Wine Glass is da bomb! Most of the most knowledgeable wine experts I know swear by the Coravin Wine System. What's a Coravin? Well, it is a tool that functions as both a bottle opener and wine pouring/wine preservation system. A thin needle pierces the foil and the wine cork, leaving the cork in place. The wine is extracted and poured out through the needle while the Coravin simultaneously replaces the displaced wine with pressurized argon, a noble gas, completely inert. When the needle is removed, the cork reseals itself. Viola! You can take a sip of a prized wine and come back to it in a year and it'll be completely preserved. It's a $299 splurge, but one that wine lovers will never forget. Almost all wine benefits from aeration, which is the main reason to decant wines. The unique and stylish Twist Decanter ($29.99-$39.99) serves both as a decanter and an aerator—a new twist in wine pouring. 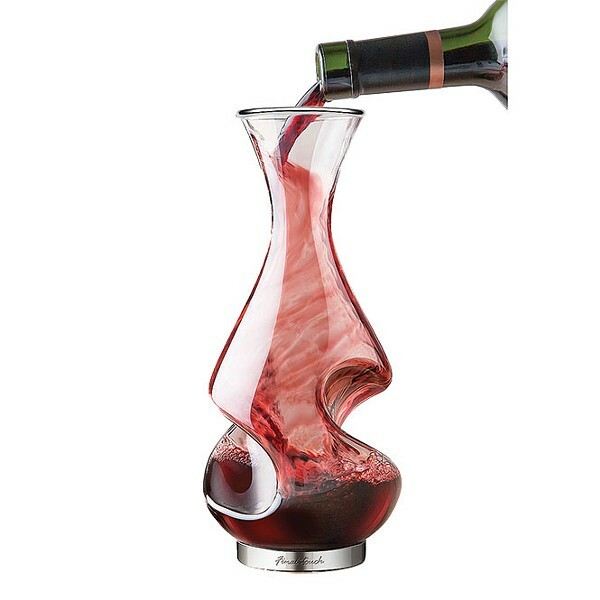 The ingenious "twisting" design of the decanter serves to aerate the wine both as it's going in, and again on the way out. It's available in 12.7-ounce and 25-ounce sizes. True wine lovers never want to stray too far from wine, which is why Oopsmark of Montreal, Canada, created the Leather Bicycle Bottle Holder. It's made of vegetable-tanned leather that clamps to the top tube of the bike frame (where some people would stow a water bottle) with antique brass fasteners, and available at Etsy.com for $34 plus shipping.